Daily Illuminator: Ogre Is A Big Hit At Congenial! 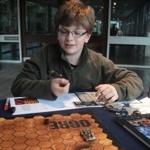 September 1, 2012: Ogre Is A Big Hit At Congenial! With a great experience at Continuum under my belt, I felt a little more confident going into Congenial. It helped that it was held in my hometown! My Ogre Miniatures demo set (starring "Dancer," my desert-yellow Mark III Ogre) got improved the week before the con, with the addition of a nice banding in sunburst yellow. This time around, I had help from our two beautiful demonstrators, Ashley and Gareth (okay, I don't think I'm supposed to call MIBs -- our selfless game volunteers -- "beautiful;" how about "beautiful but deadly"?!). 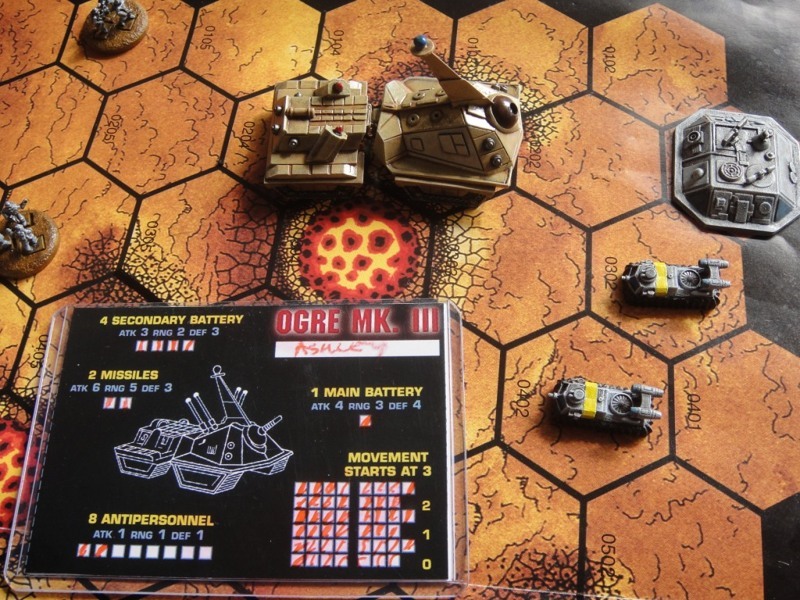 You can check out Ashley's sci-fi and minis blog "Paint it Pink" -- with lots of Ogre -- here. 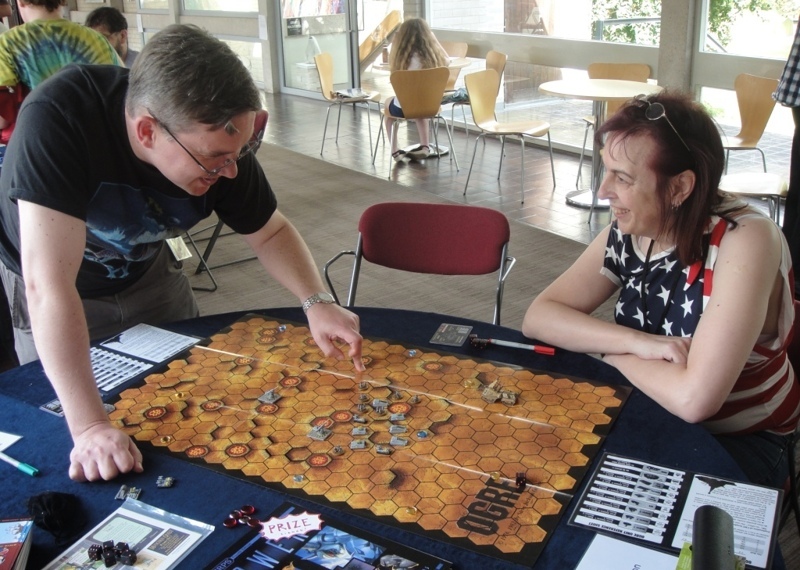 On Saturday evening, Chris Potter, who was top of the Leader Board and in pole position to win the weekend's Ogre competition, threw down the gauntlet, challenging me to an exhibition match. Oh no, the pride of the demo team was at a stake! I was given the Command Post's defense forces. I admit this put me under a lot of pressure, since all my recent competitive games had been as the Ogre, trying to crush the Command Post. I was about to learn that it's much easier to take apart the defense than to stop the monster tank! Needless to say, Chris gave me a sound whipping, easily rolling "Dancer's" giant tracks over the CP. He then added insult to injury by escaping "Dancer" off the map with one tread remaining, in front of a small crowd, no less! It was only in the shower that evening -- nursing a sorely bruised ego -- that I realized that I could have suicide-rammed my last GEV to take out that track. Nuts! Such are the stresses of playing against the giant monster tank . . .
On Sunday morning, Frank Carver (Western Europe MIB Regional Director) and I took part in the "Gaming Reboots" panel. We had a great time talking about the Ogre Kickstarter, complete with examples from the music industry and lively audience participation. Later that day, Ashley and Gareth decided that the demo team's reputation had to be defended, and threw the gauntlet right back at Chris! This time Ashley played the Ogre against Chris. In a nail-biting match -- one of the best I've seen -- "Dancer" ran through a murderous hail of fire to take out the CP before itself being blasted into an immobile hulk of scrap metal. Chris ended the weekend taking the top prize, a signed copy of GURPS Powers. As a final piece in the tale, you can read "Dancer's" own report of the convention! 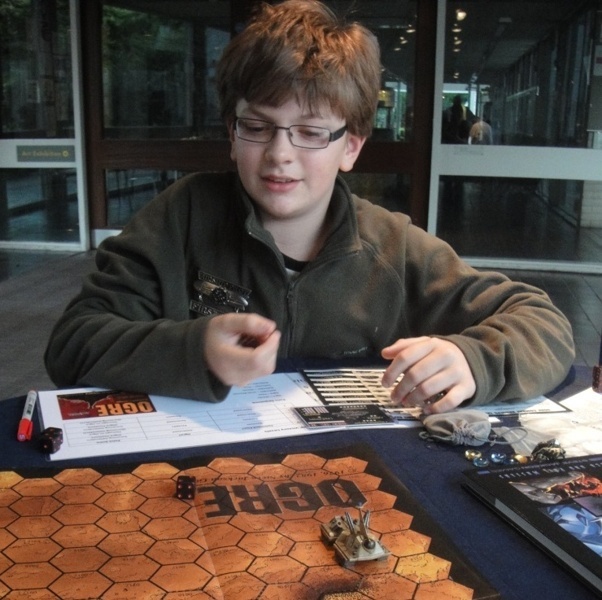 You can also find out how to join our ever-expanding section of Ogre volunteers. Next stop: Essen!